Are you curious what small businesses are doing to achieve success with social media marketing? Look no further. This article highlights nine small businesses of various sizes and industries that have transformed their online presence with innovative social media marketing practices. You’re guaranteed to find inspiration for your social media marketing efforts here. These tactics will work for just about any business—from solopreneur to multi-employee manufacturer. So let’s dive in! Scott Jarvie takes world-class wedding and nature photographs and he has trained a number of photographers using his unique methods. 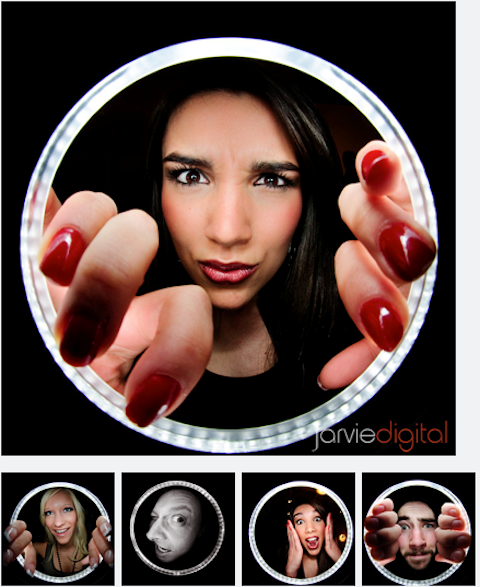 He’s even had a photographic method named after him: The Jarvie Window. The Jarvie Window has generated interest in Scott's photography around the world. As a photographer, you would expect Scott to have exceptional photos on his site, and he does. But he uses them on both Facebook and Google+ to create personal engagement and promote his products and services. In fact, Scott has developed different engagement strategies for each platform. 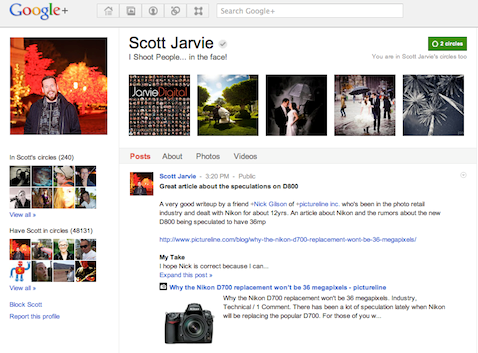 On Scott's personal Google+ profile, he is highly engaged through sharing resources and commenting. 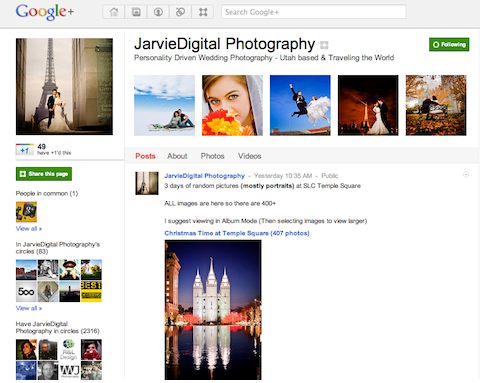 On his Google+ business page, Scott features his photo services. While Scott is a premium photographer and trainer, he demonstrates his expertise and generosity to photographers worldwide through sharing resources on his website and through his social sites. Scott not only shares valuable resources, he also promotes the work of his students—a great way to show social love. 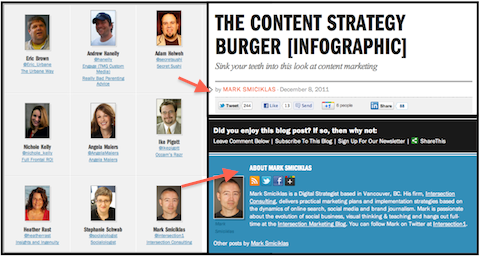 Differentiate your social strategies on your personal profile(s) from your business pages. Freely share resources with your fans as a way to grow your fan base and your perceived expertise. 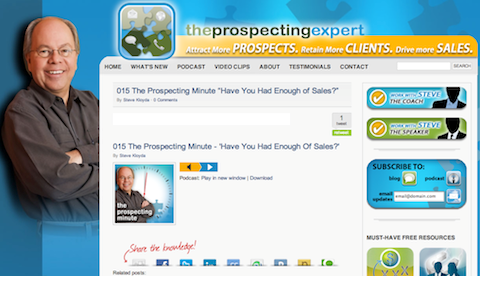 Steve Kloyda founded The Prospecting Expert, a business-to-business consulting firm that helps salespeople with their prospecting skills. He has developed a powerful social presence through the use of video and podcasts. Steve provides valuable content through a regular podcast show and video channel. Notice also the use of social sharing buttons. One thing Steve understands is branding. Through the use of his photo and logo, he has created a consistent look and feel across all of his social channels. Steve's brand is instantly recognizable. Notice also the friendly picture—important when your face is your brand. One ninja trick executed by Steve is the creation of an iPhone app for distributing his content. While it could cost from hundreds to several thousands of dollars, the marketing benefit of having your content delivered straight to your users’ mobile devices could be invaluable. 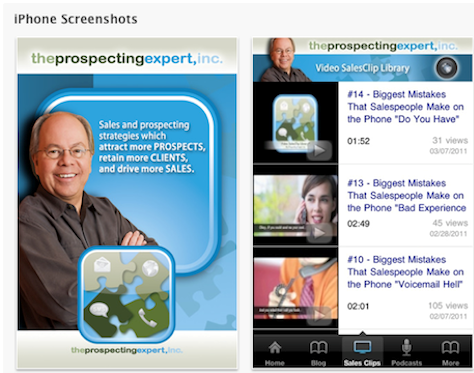 Let your customers directly access your content on their mobile devices with a customized app. Start a podcast or video show for delivering your content. Keep your branding consistent across all of your social platforms. Develop an app for delivering content to your mobile customers. Coconut Bliss is an organic dessert company based in Eugene, Oregon. Their products have become widely popular due to their social media practices. Coconut Bliss conveys a fun, social brand through rotating photos on their home page. Technorati discovered in their 2011 State of the Blogosphere report that bloggers use photos more than any other type of media (80% use photos, around 50% use videos and many fewer for all other formats). 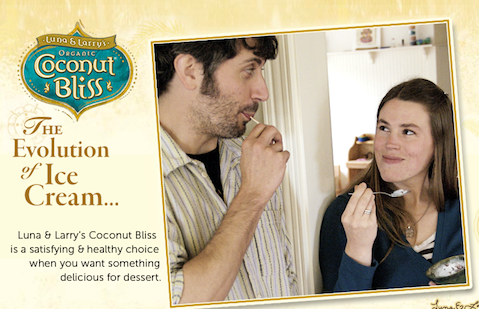 Coconut Bliss makes an effective use of fun and friendly pictures to show customers eating their dessert products. Coconut Bliss integrates photos across social platforms. Coconut Bliss makes an effective use of promotions to engage their fans. In this year’s Veggie Awards, they were able to partner with VegNews to offer a unique prize to Coconut Bliss fans while also getting partnership in a much larger promotion to all readers of VegNews. Two smart strategies: contests and partnerships. Invest in a decent camera and learn how to take captivating pictures. Integrate photos across all of your social platforms. Make strategic use of contests and partnerships to grow your fan base. Casey Hibbard highlighted JamaicansMusic in a Social Media Examiner post, but they have some unique social practices worth emulating. After all, they have achieved astronomical growth through smart social media practices—1.5 million new fans in 4 months! 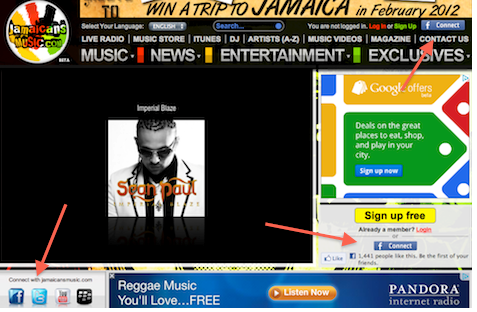 When visiting the JamaicansMusic website, one instantly gets the feeling that this is a social company. In fact, there are three different places on their home page to connect socially. Make it easy to connect socially, especially if there are multiple offers on your home page. By providing contests, free music, games and other valuable resources, JamaicansMusic has given their Facebook fans lots of reasons to revisit their page—and tell their friends about it. 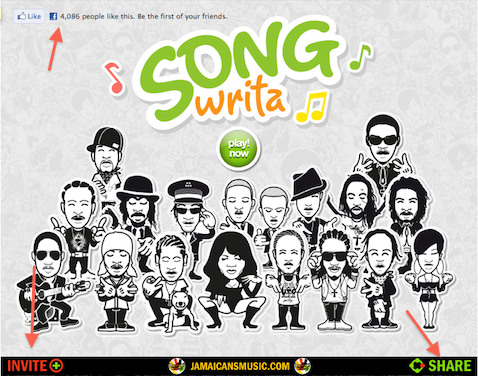 When playing this creative songwriting game, JamaicansMusic offers fans more ways to connect socially. Provide fans multiple reasons for returning to your site by offering games, contests and valuable content. Give visitors lots of opportunities to connect socially. 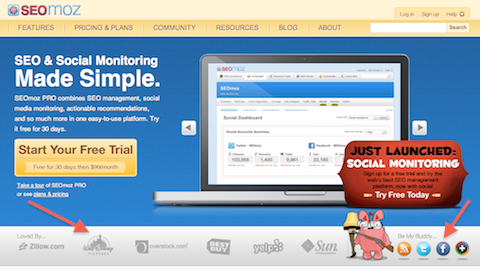 SEOMoz is a search engine optimization and social monitoring service provider. One thing that distinguishes their site is the use of gaming mechanics to spur participation from their writers and site members. Each post, comment and Like generates points that help distinguish the experts from the crowd. Gaming mechanics encourage site members to actively participate if they want to rank well against their peers. Not only does SEOMoz invite social engagement on the first visit, they also use social proof to earn the trust of visitors. See the recognizable brands in the image below. If you've done business with name-recognizable companies, ask if you can tell others. It provides significant social proof for your business. 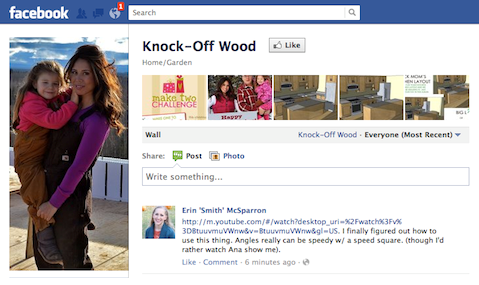 Build gaming mechanics into your site to increase social behaviors (Liking, commenting, posting). It will increase engagement and the SEO benefits are huge. Remember the important benefits of social proof. Ana White is a carpenter billing herself as a “homemaker” who has a website to empower women to do carpentry projects. With over 51,000 Facebook fans, Ana has created a massive following among women (and quite a few men) who love her easy-to-follow blueprints for do-it-yourself furniture projects. Ana's Facebook page has over 51,000 fans. Her fans post tips and projects here frequently. 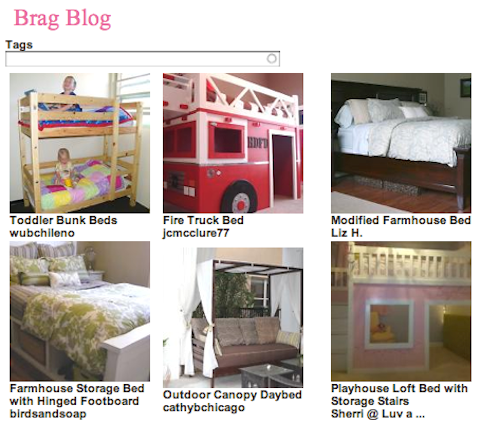 Since late 2009, Ana has been publishing free how-to guides for furniture. She also asks her fans to post pictures of their success stories—the very thing people love to do (talk about themselves). As a result, she has a very popular site where most of the posting comes from fans. Very smart! 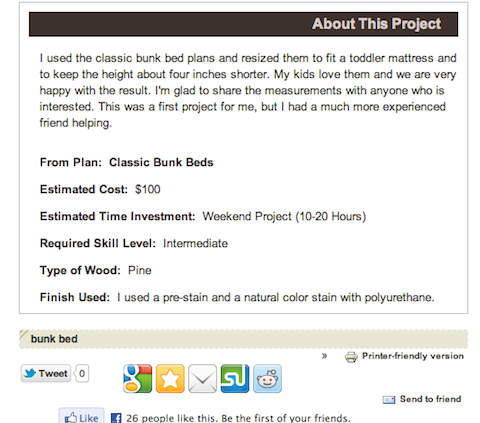 Ana's fans love to post pictures of their successful home projects. Notice all the social sharing options Ana makes available at the end of the post above. She makes it easy to share with friends. Ana has also created a very engaged community on her Facebook page that complements, but is distinct from, her blog. Remarkably, she doesn’t post that often—she doesn’t have to. While she comments on at least half of the posts, her fans are busy posting and answering questions for each other. Create a community where users can talk about themselves. Empower your fans to share their experiences with other users. Have clear strategies for your blog and Facebook page. 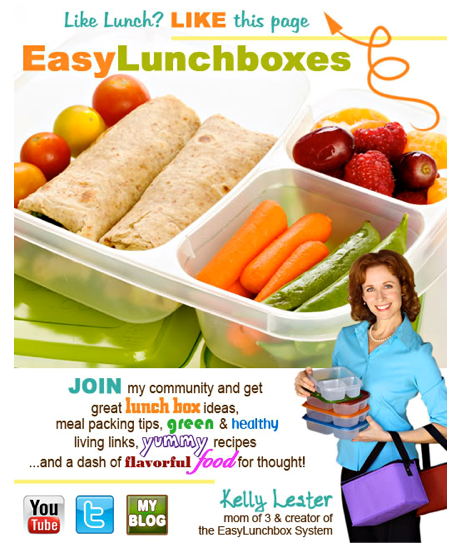 Kelly Lester founded EasyLunchboxes out of a personal desire to find healthy ways to package food she sent with her children to school. As a solopreneur, she has found unusual success due to her wise social practices and great social branding. Her blog presents a clean, compelling look into her company. On her website, Kelly has integrated multiple opportunities to connect socially and to subscribe to her newsletter. In addition to inviting social connections, Kelly has positioned herself uniquely as the "Singing CEO," a title that will be easily remembered. An important piece of social real estate is the Facebook welcome tab. 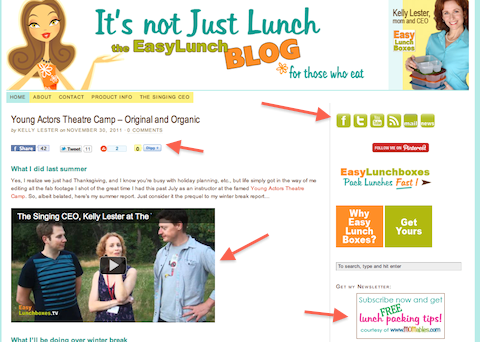 Kelly makes good use of this space by keeping her brand exciting, telling visitors what to expect from her page and promising valuable content. Your welcome tab should give visitors a sense of what to expect on your page. Kelly has created a focused plan to market through Facebook, Twitter, YouTube and her blog. She delivers unique content on each channel and integrates them with each other—all while maintaining her personal life as a mom and actress. With her acting background, Kelly has distinguished her YouTube channel by creating her own TV series. 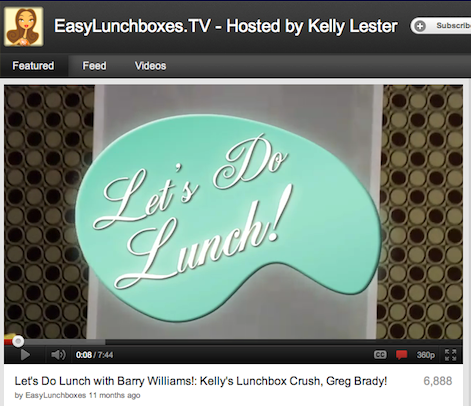 This includes over 150 videos where she has even given her audience a chance to share videos of why they like EasyLunchboxes. If you or someone you know has an acting flair, think about creating your own video series. Take full advantage of Facebook’s welcome tab to let potential fans know who you are and why they should Like your page. Differentiate your social strategies to match the platform and your skill set(s)—think outside the box if you have some unique talents available like acting or singing. Take the time to get your visual branding right. Social Media Explorer is a business-to-business education and information products company focused on social media and digital marketing. 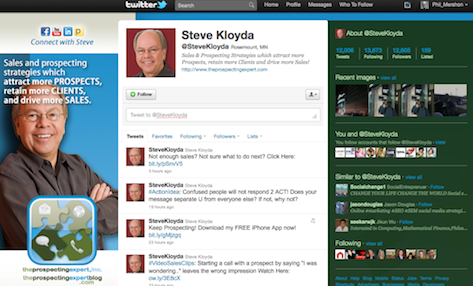 On their home page, Social Media Explorer has taken advantage of Intent, a Twitter plugin. This allows a user to see if he or she already follows this business. What users see if they are following Jason Falls. 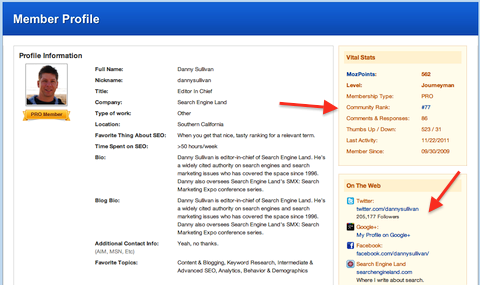 As a blog, Social Media Explorer features numerous guest authors. To show social love to these authors, Jason Falls and Aaron Marshall have prominently highlighted the social profiles of each of their authors. This allows readers to quickly connect with the experts and enables the authors to expand their influence. 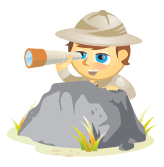 Each Social Media Explorer author receives prominent recognition for their articles and an easy way for readers to find them on various social platforms. 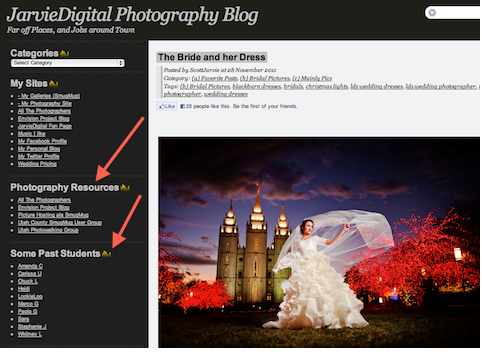 Make it easy for site visitors to follow you. Show appropriate social love to your guest authors by featuring their social profiles prominently. After years of failed attempts to market his innovative tongue brush, Dr. Bob Wagstaff decided to give YouTube a try. Spending only $500, he created his first video. In less than 3 years that video has been seen more than 16 million times and helped to generate over $1.6 million in sales and contracts with Wal-Mart and CVS Pharmacies. Talk about something that people care about—in this case, bad breath. Keep your video short—Dr. Bob’s video was only 2 minutes long. Embed your video on your home page. Grab people’s attention in the first 5 seconds—with some minor editing, this video incorporates quick, edgy statements that pull the viewer into wanting to hear the solution. Offer something for free—your first Orabrush is free, if you’ve watched the video. Here are more tips on video marketing. 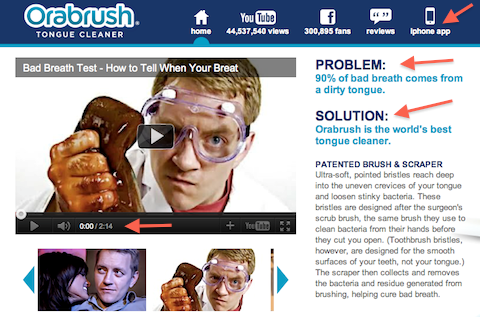 Orabrush embedded their popular video on their home page, while answering a problem that concerns many people: bad breath. 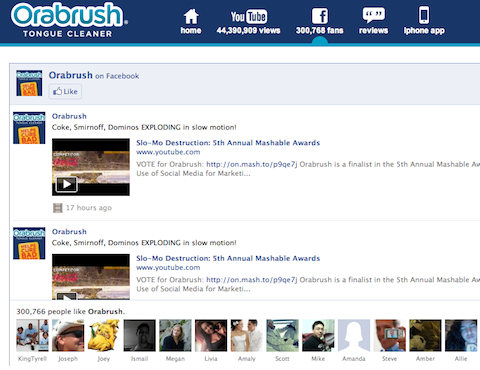 Some other best practices used on Orabrush’s website: They made it easy for users to tell their stories with video clips. They also prominently feature quotes from the traditional press on their page. Finally, they make their YouTube channel prominent, because this has been a key to their success. Let individuals and the press sing your praises through videos and quotes on your website. Finally, Orabrush understands the importance of keeping customers on their website, so they integrated Facebook onto their site. Integrate Facebook to keep fans on your website. If you have a great product or service, don’t give up on your dream. Instead, think about how social media might help you get your ideas in front of your ideal customers. Follow best practices for creating quality videos. Make use of fan and video reviews on your page. These nine small businesses have many more things to teach other small businesses everywhere, but they aren’t the only ones. What do you think? What have you learned that you’d like to share? Leave your questions and comments in the box below.